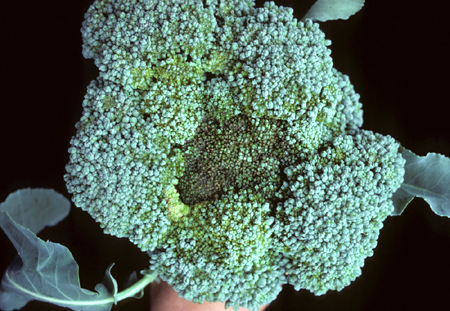 Downy Mildew occurs wherever brassica crops are grown and infects cabbage, Brussels sprout, cauliflower, broccoli, kale, kohlrabi, Chinese cabbage, turnip, radish, and mustard as well as cruciferous weed species. The disease caused by Hyaloperonospora parasitica is particularly important on seedlings but can also cause poor growth and reduced yield and quality of produce at later plant stages. Small, angular lesions develop on leaves and inflorescences. These lesions enlarge and become irregular, yellow to orange necrotic patches, with dense sporulation on leaf undersides. Heavy sporulation gives leaf undersides a gray to purple, downy appearance. Downy mildew overwinters on winter-sown host crops or cruciferous weeds. Infection of leaves and inflorescences results from sporangia produced on living hosts. Secondary sporangia are spread by wind and splashing water. Oospores, if produced, survive in crop residues and in the soil. There is some evidence that H. parasitica may be seed borne. The pathogen is favored by cool, moist conditions. On seedlings, cotyledons and hypocotyls may become infected and seedling loss can occur. In more mature plants, small, angular lesions develop on leaves and inflorescences. A pale brown to gray discoloration occurs on the surface of heads or curds and black streaks may develop on the stems. Affected tissues become susceptible to attack by secondary rotting organisms. 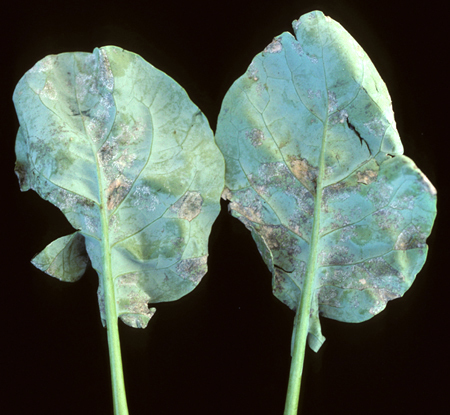 Downy mildew also attacks the taproots of turnip and radish and infected organs develop a black, epidermal blotch and an internal discoloration. Removal of crop debris and weed hosts may reduce inoculum. Practice rotation with non-brassica crops. Manage Downy Mildew on transplants in the seedling bed by improving air circulation, irrigating early in the day, and applying fungicides. Plant resistant or tolerant cultivars.